Our Amish woodworkers have put together sideboard and hutch for a gorgeous dining room storage option with the Amish Royal Mission Side Board with Hutch Top. This wooden storage commands the room with rich authentic woods drawing the eye. Combining shelving with counter space, cabinets, drawers and a lower shelf, your choice of wood is crafted into a masterpiece. 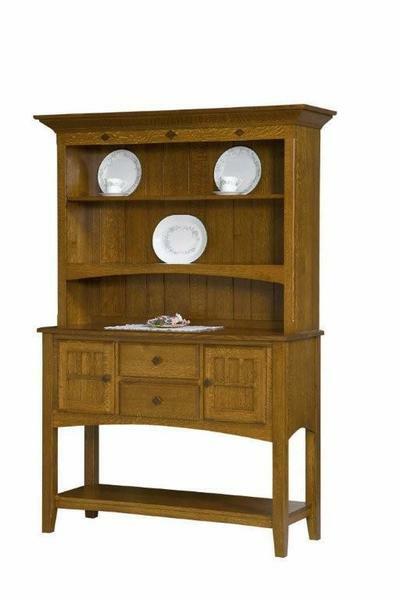 The Royal Mission Side Board with Hutch Top provides the storage you're looking for in the dining room or kitchen. Custom options truly create a look just right for your home. Select options online or get personal service today from a Furniture Specialist. We can be reached by email at Questions@DutchCrafters.com or phone Toll-free at 1-866-272-6773. Side Board Width: 52 1/2"
Doors are standard with plain glass or solid wood.